I’m happy to host the 164th Management Improvement Carnival on View From the Q this month. What’s the Management Improvement Carnival? It’s a monthly feature hosted by ASQ Influential Voices blogger John Hunter where he or a guest collects and discusses interesting, timely articles on quality, improvement, innovation–you name it. Another “quality culture” topic comes from blogger David M. Kasprzak of My Flexible Pencil. David discusses the office “supply chain.” Why do we go back to “suppliers” (vendors, employees) who fail us? 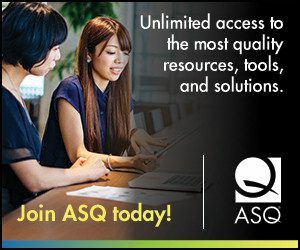 This was a popular article on ASQ’s Twitter, and seems to be a common problem. Employee Engagement: This New Yorker piece brings an interesting glimpse into the hiring and training policies at the Japanese clothing manufacturer Uniqlo, which “hires a lot of people, and spends a lot of time training them.” Article conclusion: more full-time workers and better, more intense employee training can equal success for retailers. Training and Learning: Speaking of training, Kevin Meyer of the Evolving Excellence blog writes about the purpose of knowledge in the 21st century. Should we specialize in one subject, or should we know a lot about a lot of topics? I’m curious about what quality professionals think. Innovation and Manufacturing: What does innovation look like in a tradition-based industry of matzo manufacturing? What lessons can we learn about innovation in a challenging field? The Manufacturing Innovation blog discusses a recent New York Times article on two matzo producers: Manischewitz and Streit’s. Email Management: This Fast Company article discusses email overload and tools that help organize the deluge (for example, “activity streams” that file emails by topic). For another look at controlling email, read the March QP cover story on how one company got email under control. Making Quality Fun: Finally, I’m always delighted to see the creative and unique posts produced by the Minitab blog, Statistics and Quality Improvement. In April, Minitab featured topics like the NFL draft, Titanic survival rates, and, perhaps my favorite, Designing Experiments with Gummi Bears. Yes, Gummi bears. What a way to make statistics and quality fun, creative, and topical! Previous Previous post: Are Quality Professionals Happy On the Job?